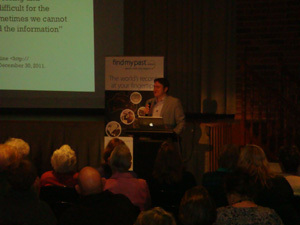 In August, findmypast.com.au held our very first speaking tour featuring Joshua Taylor, the Lead Genealogist on findmypast’s North American team. Coming all the way from Los Angeles, Joshua delivered presentations in Melbourne and Sydney on successful online searching, records that add depth to family trees, and new updates coming soon to findmypast. And, though not quite as distant as California, several audience members had themselves travelled for hours to hear Joshua’s talks. Some in our Melbourne audience had driven from Ballarat, while our Sydney audience featured attendees from as far afield as Shoalhaven and even one from Perth! Before the first session, we joked with Joshua that the pressure to deliver was certainly on. Fortunately, though he is far too humble to tell you this sort of thing himself, Joshua is an experienced keynote speaker and a recipient of RootsTech’s Distinguished Presenter Award – and his presentations did not disappoint. Joshua wears many hats in the North American genealogy world, serving as not only findmypast.com’s Lead Genealogist but also the President of the Federation of Genealogical Societies. As though that weren’t enough, he is also one of the genealogical experts featured on the new PBS show Genealogical Roadshow, having been featured in the past on Who Do You Think You Are? In addition to his tremendous workload, Joshua had a super-packed tour schedule, full of in-depth talk preparation, meetings, media interviews and press appearances. With just half a day off during his entire trip Down Under, he had only two items on his ‘must see’ checklist: like every American visiting our sunburnt shores, Joshua longed to see a kangaroo*; and, like a typical genealogist, he was determined to visit a certain plot in Melbourne General Cemetery. During one of his talks, it emerged why. Joshua revealed that the sole Australian connection on his family tree also happened to be his favourite relative, a circus performer called Samuel Omar Kingsley. Born in Illinois, Omar performed in circuses from St Louis to Russia, Italy to India. He even resided in Australia for a few years. His twin daughters were born in Melbourne, one of whom was named Ella Zoyara, after the female persona Omar assumed in the circus ring. Sadly, Omar died in 1879, having never met his daughters, who both died only a few months old. Fortunately, Josh was able to track down their plot and locate some more information from the Melbourne General Cemetery registers. It was a wonderful example of the colourful characters and tragic, bittersweet stories that abound on many family trees – and how ‘on the ground’ family history research remains crucial to genealogists tracing their ancestry in distant locations. But, as Joshua’s talks proved, online research is also essential, especially with the increasing digitisation of records. Indeed, Joshua gave a sneak peek into the millions of new records coming soon to findmypast.com.au, as well as some exciting new technology to help you search even more efficiently. Joshua’s clever presentations outlined many resources and strategies to deepen, broaden and speed up our family history research. Between you and me, even we learnt a trick or two to improve our online searching technique! As proven by the rave reviews and warm thanks that Joshua received, the audience – some high-profile Aussie genealogists included – concurred. Many thanks again to all who attended and helped make the events so much fun, and of course to Joshua for all his hard work, enthusiasm and sheer expertise! We hope he can visit Down Under again, and for longer, soon. 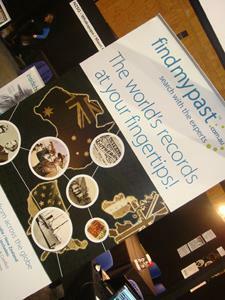 By findmypast.com.au Team Member, Sarah Trevor.